Bill Belichick is an NFL coaching icon, and an inseparable part of his legacy is the "hoodie," or more specifically, a hooded sweatshirt with the sleeves hastily cut off to fall at varying lengths. The mystique of Belichick and the Patriots has been well-earned over the past decade plus, with the infamous hoodie being the sideline trademark of New England's future Hall of Fame coach. "In all honesty I really don't pay that much attention to it, I swear I don't. People ask me after the game why did you wear the blue one, why did you wear the gray one? I just put on whatever is there." Many assume Belichick's been hooded ever since his coaching career in New England began, but that is not the case. Like the man himself, the hoodie is steeped in mystery, with it's reputation outweighing the real history of when it came about. It wasn't until 2003 that the Reebok NFL Equipment Hooded Sweatshirt was introduced to the league. Prior to that, Belichick was more fond of windbreakers, wearing those for the better part of his first three seasons in New England, including Super Bowl 36. 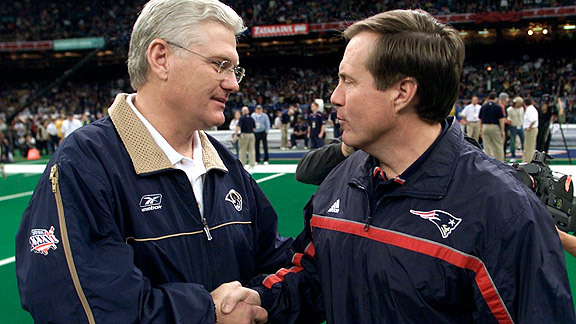 The first game we find Belichick wearing the infamous Reebok hoodie, still with sleeves intact, was November 11th, 2003 in a game against one of his former mentors, Bill Parcells and the Cowboys. Belichick would go on to wear that grey hoodie in multiple games the rest of the 2003 season, including the AFC Championship that saw his Patriots defeat Peyton Manning and the Colts. And yet he still went back to the windbreaker for Super Bowl 38. He hadn't gone full hoodie yet. In 2004, Belichick truly became the hoodie-loving coach we've come to love (or hate), yet the sleeves still survived the entire season. In all, Belichick wore the grey Reebok hoodie for at least ten games that season, including all three playoff victories. But, in a preview of what was to come, Belichick was constantly pushing the sleeves of his hoodie up during the Super Bowl against the Eagles. The following season, perhaps emboldened by his third championship in four years, Belichick finally took the scissors out. For reasons he would later describe as "short arms," Belichick first slashed his sleeves off a mock-hoodie sweatshirt in an embarrassing 2005 Week 4 home loss to the San Diego Chargers, 41-17. The hacked hoodie may be the sweatshirt everyone associates with Belichick, but it was the mock whose forearms fell first. Four weeks later the hoodie suffered the same fate. 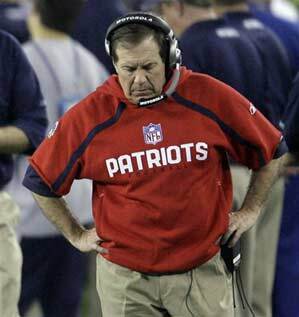 The first appearance of Belichick's signature coaching look, the hoodie sans sleeves, was in a 2005 Week 9 loss to Peyton Manning and the Indianapolis Colts. The loss broke a six-game undefeated streak for the Pats against Manning. Despite the loss, Belichick went on to wear that hoodie at least twice more in the regular season and in both playoff games, including the loss to the Broncos, his first in the playoffs with Tom Brady. Though it's the look he's known for, the Patriots have had some tough losses when Belichick dons his hoodie. Once Belichick started playing amateur tailor and gaining national recognition for his curious sideline style, the Patriots stopped winning Super Bowls. Despite that fact, Belichick has now coached more games in that hoodie than anything else, with a dominant record of 29-9. There have been other variations, like the blue Reebok hoodie and blue mock that were introduced in 2009, and the Nike grey hoodie that took over in 2013, but seven years later the hacked grey Reebok hoodie is deservedly the most popular. The only other hoodie that stands out almost as much is the dreaded red one from Super Bowl 42. Given his hoodie history, the choice really made no sense. He hadn't worn red since the previous season, and never had he gone sleeveless in anything other than old faithful or the original mock. Fans were rightly jarred to see Belichick in red, and the short-sleeve quality of the cut-off job was extra bothersome. In all, Belichick has worn a red hoodie just a handful of times, but only once were the sleeves trimmed, and that was in the Super Bowl. No hoodie is more vilified, even leading Belichick's girlfriend Linda Holliday to assure Patriots fans he would not wear a red one again in Super Bowl 46. Belichick went back to his bread and butter in his next playoff game in 2009 against the Ravens, and the Patriots suffered the first Wild Card round exit of the Bill and Brady regime. Since then, Belichick has strayed from a grey hoodie without sleeves just once in the playoffs, 2010's loss to the Jets, in which he wore the blue version. When Nike took over the NFL apparel from Reebok in 2012, it meant Belichick could no longer wear the Reebok variations that had become such a staple. Thus, we've seen the last of that original hoodie. The final years of Belichick's legacy will be determined in the new Nike hoodies. Regardless of hoodie type, grey is the dominant shade Belichick should stick with. A statistical analysis run by researcher Bob Yoon on Belichick's hoodie history found that the Patriots play better than expected when the coach is in grey, with their expected win-loss ratio at 58.39-19.61, and their actual record at 63-15. The Patriots also have their biggest margin of victory when Belichick is in grey by 11 points. But the fact remains, the Patriots haven't won a Super Bowl since coach lacerated his sweatshirt. Of course, it begs the question, if Belichick doesn't make his own garment choices, who does? And do they understand the history of the hoodies and the implications of their choices? If so, it might be time to persuade Belichick to make peace with his short arms and save some sleeves. You can view the full Belichick Hoodie Database here. Tips for missing games are welcome! Mike Dussault is a New England Patriots Featured Columnist and is the Managing Editor of PatsPropaganda.com. You can follow him on Twitter here.